The new plant will use BP's gas phase polypropylene process technology. The new technology will be based on a proprietary high activity CD catalyst. The project is based in the town of Litvinov in the Czech Republic. 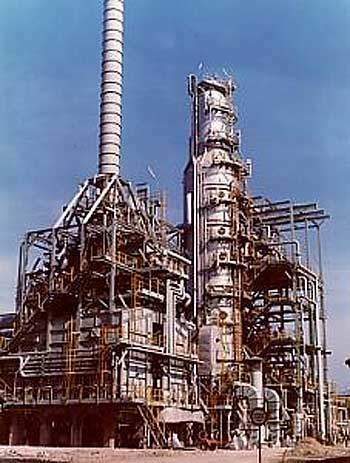 It consists of the construction of two plants, one for polyethylene and one for polypropylene. The new plants are part of an extensive investment programme by the Unipetrol group worth Koruna 8 billion ($211 million) for the period 1998-2002. This programme is intended to help increase the efficiency of the company’s operations. After 2002, Unipetrol hopes to double its turnover through the results of the investment programme. The contract for the polypropylene plant was worth $48 million, and was awarded in the first quarter of 2000. The plant will be completed mechanically at the end of 2002, and go into commercial production in 2003. The polypropylene plant will have a capacity of 250,000t/yr as opposed to the 115,000t/yr capacity of the old polypropylene plant which it replaces. The new plant will use BP’s gas-phase polypropylene process technology. The new technology will be based on a proprietary high-activity CD catalyst. The old plant, which is being replaced by the new installation, was run by Amoco technology. BP may also be involved in sales and marketing for some of the product. The award of the contract to build the high-density polyethylene (HDPE) plant was placed with Linde-KCA-Dresden GmbH, and is worth $56 million. The capacity of the polyethylene plant after completion will be 200,000t/yr, together with the old HDPE unit this totals 320,000t/yr. Union Carbide partly merged its operations with Exxon to create a technology joint venture called Univation Technologies. The joint venture was contracted to provide the process technology for the polyethylene plant. This is the first time that Univation Technologies has licensed a process in eastern Europe. The contract for the polypropylene plant contract was awarded to Foster Wheeler Italiana, SpA. The Italian firm defeated both Chiyoda and Technip for the work. The contract calls for the supplier to provide engineering, to supply equipment and materials, and to construct the plant at Litvinov. The Foster Wheeler contract for the project will be financed by a Buyer Export Credit guaranteed by SACE, the Italian state insurance agency, and by commercial loans. The American Exim Bank guaranteed 90% of the license fees for BP and Union Carbide to supply process technology to the plant.